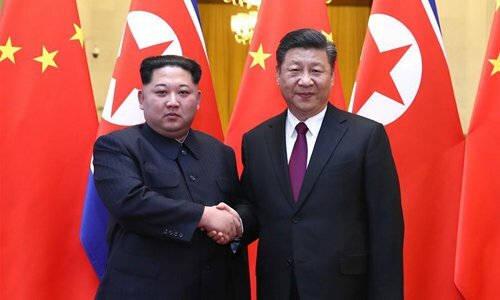 Kim Jong-un, chairman of the Workers’ Party of Korea and chairman of North Korea’s State Affairs Commission, paid an unofficial visit to China March 25 to 28, and was warmly received by Xi Jinping, general secretary of the Central Committee of the Communist Party of China and Chinese president. The two leaders held candid and friendly talks, stressing the need to inherit and carry forward the traditional China-North Korea friendship. Denuclearization of the Korean Peninsula and safeguarding peace and stability on the peninsula were also top on the agenda. Undeniably, the Xi-Kim meeting opened a new chapter in friendly China-North Korea relations. China and North Korea are neighboring countries with unusual ties. In the past century, the two countries were mutually dependent and stood together through all the miseries in Asia’s history. Their collaboration in wars contributed to their unusual friendship. The outside world also regards China and North Korea as a community of common interests. Given the sophisticated geopolitical environment in Northeast Asia, the historic traditional Beijing-Pyongyang bonds and their realistic political and economic ties have been a focus of widespread attention, and have affected the way other forces assess the regional situation. Despite trials and hardships, the basic elements of friendly China-North Korea ties are solid and unshakable. To begin with, Beijing and Pyongyang respect each other and are equal partners. The China-North Korea state-to-state relationship is led by their party-to-party relationship. Their friendly ties have a solid political basis. The Chinese party, government and mainstream society respect the North Korean people’s political choice, respect North Korea’s spirit of independence and self-reliance, and firmly oppose other countries’ attempts to interfere in North Korea’s political system. The two countries have a profound basis for friendship and immense room for cooperation. Due to historical and geopolitical factors, Beijing-Pyongyang ties have been cemented strategically. The two countries’ leaders have made strenuous efforts to strengthen their strategic partnership. Friendly China-North Korea relations carry great significance despite changing focal points in Northeast Asia. It turns out that maintaining a friendly relationship between China and North Korea is an important strategy to protect their interests. Friendly Beijing-Pyongyang ties inject positive energy and ensure the strategic stability of Northeast Asia, which can enhance regional balance and eliminate some unrealistic motives. Stability paves the way for better communications and solutions to problems as well as serving as an effective method to prevent risks. The international community should support such visits – relatives-style interaction between the two countries across the Yalu River – as it may highly likely become a strong driving force to lead the peninsula toward reconciliation and prosperity from the current deadlock. In the foreseeable future, friendly ties between Beijing and Pyongyang will undoubtedly be the most stable channel to help ease tensions on the peninsula, which should be cherished and supported by various forces that truly care about peace there. Some international forces have been attempting to obstruct and undermine China-North Korea relations. They affix a variety of labels to the friendship between Beijing and Pyongyang, and spread rumors that distort bilateral relations. However, the deep roots of the China-North Korea relationship are solid beyond their imagination. The Xi-Kim meeting will renew their understanding of the bilateral relationship. It’s believed those with a sincere hope for peace and stability on the peninsula will welcome today’s China-North Korea relations. It is hoped that the traditional friendship between Beijing and Pyongyang will continue to flourish, serve the interests of people from both sides as well as regional peace and stability. It is believed that the bilateral friendly relationship will surely keep moving forward in the future. North Korea has not only consolidated its independence and autonomy over the years, but also demonstrated tenacity and considerable progress in economic and social development. China and North Korea, who once fought side by side in war, should be partners in jointly establishing a safe and prosperous community.